Edit: Unfortunately we can’t update the camera lists due to Google’s decision to disable parts of their search API and scraping restrictions. Thus most of the links are dead and displaying a black image. Sorry. SurveillanceSaver is a simple screen saver that displays more than 1000 surveillance cameras worldwide. It is an addictive live soap opera for more than 30.000 people that downloaded it and watching it since november 2007. It has been covered in BoingBoing, Wired, Times Online, Make: blog, Spiegel Online, Jetzt Magazin, etc..
News: A new release of SurveillanceSaver will come out soon. The iPhone App SurveillanceShaker is available! The project started as an experiment within my dissertation about a “Reality Filtering System” at Fraunhofer Institute for Computer Graphics. While searching for “remote eyes” a DIGG article about finding Axis network cameras via Google led to the quick development of a simple OS X screen saver showing that images randomly. The results were impressive and addictive. The screen saver showed live images of streets and buildings but also surprising images of russian internet cafes, hotel lobbies, server rooms, barns with little pigs, etc. It came out that the images of a hundreds of these surveillance cameras were not protected accidently. Once published the blogosphere picked it up and led to ten thousands of downloads in the first days. BoingBoing / Wired’s Mark Frauenfelder was the first one, followed by Make: blog and others. The success and the positive reactions of users led to further development. Due to its Creative Commons License a lot of people sent bugfixes and additional camera feeds. Daniel Kupczyk joined for the development of a Windows version. 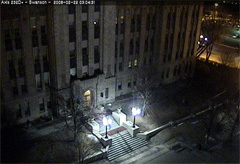 I startedÂ the development of web crawlers for building a huge database of public available network cameras. Geolocalization was added an thus a visualization in Google Earth. Today Dashboard Widgets, an iPhone application and a simultaneous high-resolution visualization of all cameras on Fraunhofer IGD’s 32 Megapixel Multi-Touch Wall are in the works. 1. 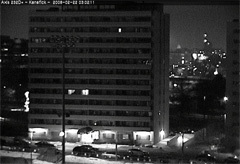 SurveillanceSaver is simply a television-like application that serves our voyeuristic nature. What will be the next image? Where is he walking? Will something happen in this scene? Will the pig be still there tomorrow? 2. SurveillanceSaver is democratizing the growing surveillance in our society. It answers the question about what the watchers are watching in the world and in our neighbourhood. Everybody can join and decide if this is helpful and healthy for our society. 3. SurveillanceSaver and the tools behind itÂ can also become a tool for the new Blockwarts and Neighbourhood Watchers in our society. An experiment that becomes an unrulable monster. The destiny of every new technology like Joseph Weizenbaum warned us. Copy the file into your home folder’s “Library/Screen Savers” and activate it in “System Preferences/Desktop & Screen Saver”. Please use it on your own risk: The screen saver is still alpha. 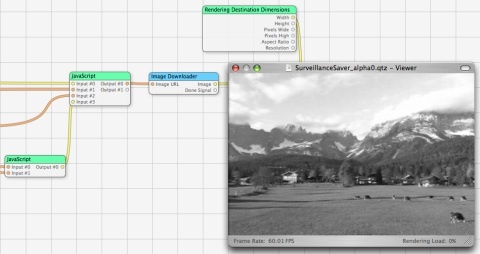 SurveillanceSaver is under Creative Commons license..